A great set of boulder shoulders can seriously set off a muscular physique. Huge shoulders create width and presence; they frame the upper body and accentuate the sought after V-shape. [caption id="attachment_4521" align="alignleft" width="400"] Pic: Broscience[/caption] The shoulders, or deltoids, also play a hugely pivotal role in many other cornerstone lifts, such as bench press, rows, and even deadlifts. But the delts are often poorly trained. Sloppy form is commonplace, leading to poor development and injury. The mind-muscle connection is the key to building great shoulders; check your ego at the door and learn to effectively concentrate your efforts on the stubborn deltoid muscles. Most of us don’t have huge, hulking chunks of prime muscle stacked on our shoulders, like Markus Ruhl in the picture. For most of us, the delts are a relatively small muscle group easily overtrained. Focusing your training is the key. It can be hard to obtain that elusive and satisfying pump telling you it’s game over, unless you effectively communicate with your muscles. Let’s take a look at this mind-muscle connection. The great leader, Daisaku Ikeda once wrote: "When our determination changes, everything will begin to move in the direction we desire. The moment we resolve to be victorious, every nerve and fiber in our being will immediately orient itself toward our success. On the other hand, if we think, 'This is never going to work out,' then at that instant, every cell in our being will be deflated and give up the fight." You must focus every fiber of your physical and mental being on your lifting to achieve optimal results. It is key to understand the way your deltoids work and contract to train them to their full potential. How do you do this? You have to feel them. Begin by using very light weights, or no weight at all. Using absolutely proper form, feel the muscle move through its full range of motion. Do not swing the weight or use momentum. Visualise the muscles contracting. See the blood pumping into the muscle fibers. Touching the working muscle while lifting can help pull focus into the target area. 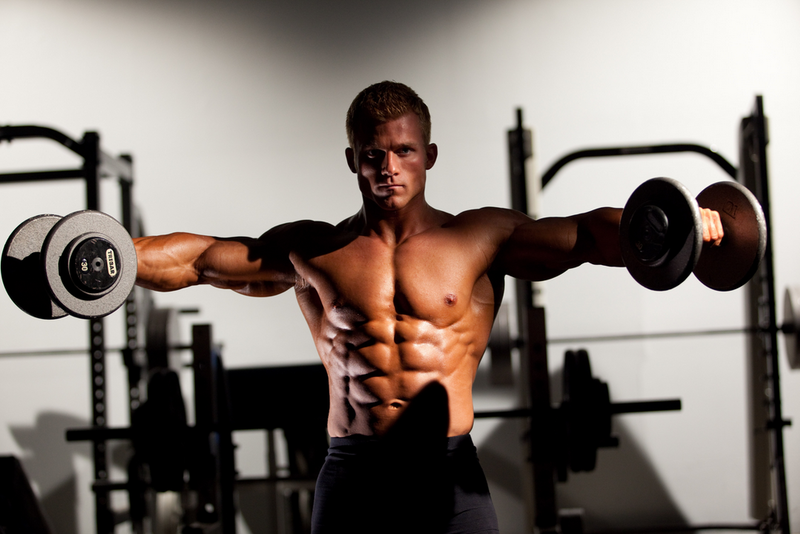 Perform some concentric phases slowly and feel the muscle contract. Flex the muscles between sets to help maintain the mind-muscle connection. Take supplements that help with focus and drive. Sheer Strength Labs Pre-Workout Powder contains a potent formula of pure ingredients proven to provide energy, focus and increased muscle synthesis. [caption id="attachment_4517" align="alignright" width="400"] Pic: Muscleandperformance.com[/caption] Now for some shoulder anatomy. 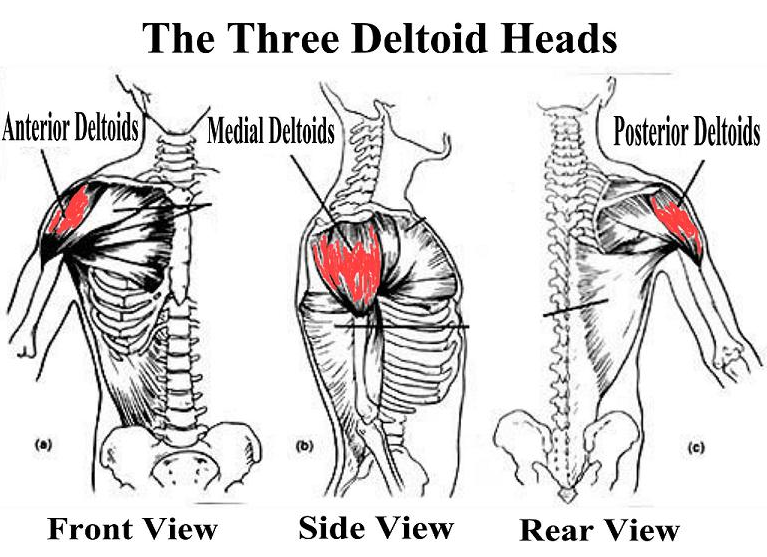 The deltoids are composed of three distinct muscles sitting next to each other, running vertically. The anterior or frontal deltoids sit, unsurprisingly, at the front of the shoulders, alongside the pecs. They pull the arm up and forwards. The medial or lateral deltoids form the bulk of the delts and create width. The lateral delts raise the arms directly to the side. The posterior or rear delts sit at the back of the shoulders, just above the triceps. They pull the arms backwards. The diagram shows just how small the front and rear delt heads are. They are easily overtrained, as they play massive roles in other heavy lifting days. The frontal delts are worked during bench pressing, and the rear delts are heavily employed during back training. All of us have felt this, but some much more than others. If you are one of those people who feels severely bruised front and rear delts after chest and back day, consider breaking up your shoulder training. Instead of training all three heads on the same day, train rear delts at the end of back day, and front delts after chest training. That way you avoid effectively training these small muscles twice as often as other muscle groups, allowing them adequate time to recover and grow. Taking Sheer Strength Labs Sheer Recovery Post-Workout Supplement helps your muscles kickstart their recovery by feeding them everything they need to begin protein synthesis. [caption id="attachment_4520" align="alignright" width="400"] Pic: Muscleandperformance.com[/caption] As with all other body parts, the best exercises for packing on mass are big, compound lifts. For delts, this is the mighty shoulder press. For many years, the barbell was king here. Pressing behind the neck was commonplace, but now we know that leads to shoulder injuries for a lot of people. The front or military press has taken over as the best barbell exercise for shoulders. To perform an effective military press begin with a natural feeling grip, just wider than shoulder width. Now, keep your shoulders back, your chest puffed out, and your shoulder girdle steady, press the bar above your head, keeping your elbows back to ensure proper engagement of the lateral deltoids. Feel the squeeze at the top of the movement. A common mistake people make is lowering the bar farther than necessary. You only need to lower the bar until the delts are fully stretched. This should be somewhere around chin level. Going lower only forces the shoulder girdle to move, taking effort away from the delts, and opening the shoulders and elbows up to injury. 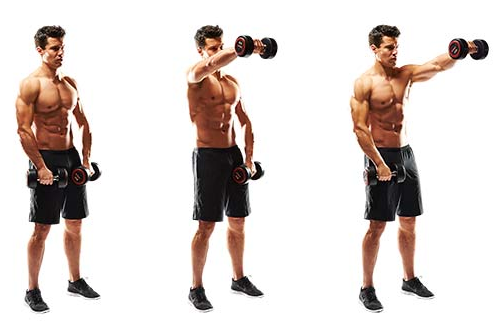 The best pressing exercise for building boulder shoulders is the dumbbell press. This excellent lift allows you to hit the delts with heavy weights, while working them through a more effective and natural range of motion. It is also more effective at targeting the lateral heads, due to its natural arc. As with barbell presses, keep your shoulders and elbows back. Feel the squeeze at the top, and lower slowly, feeling the muscle stretch. Performing shoulder presses seated is a great way to eliminate cheating and momentum, as well as supporting the lower back. Mix up your shoulder training to keep the delts guessing. Don’t always start with pressing exercises. Try pre-exhausting from time to time, or begin with upright rows. Do dumbbell presses one week, and barbell press the next. Remember the mind-muscle connection is key to effective training and building boulder shoulders. Concentrate your efforts on the target muscles and don’t be tempted to use excessive weight. Taking Sheer Strength Labs Sheer NO2 Nitric Oxide Booster helps you train to skin splitting pumps.